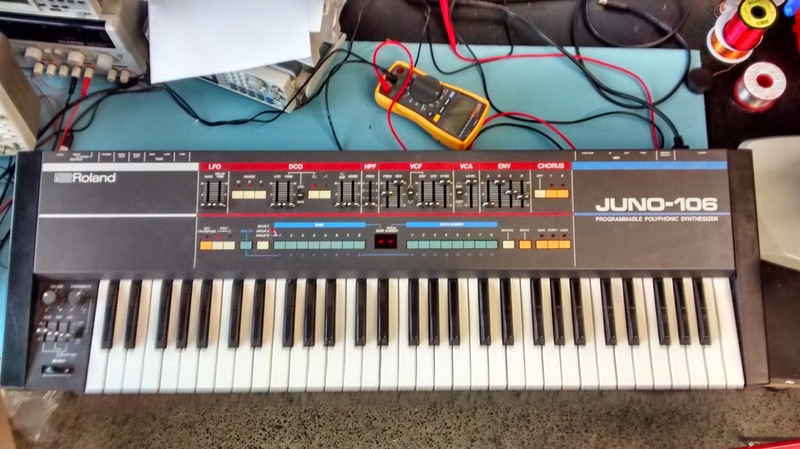 So a while ago I found myself in the possession of a faulty Roland Juno-106 synthesizer. For those not in the know, they're a somewhat iconic 80's synth. It's been sitting around my place for awhile now, and I decided it was time to fix it. Fortunately for me, the process for diagnosing and repairing one of these guys is pretty well described on the internet. My key resource was the Analogue Renaissance website. To work out what was wrong with the keyboard, I had to put it in a "test mode", and follow the test procedure. Turned out 2 of the VCA ICs (integrated circuit) were stuffed, which is apparently a fairly common problem with these keyboards. Initially I tried to purchase replacements from the Analogue Renaissance guy, but he didn't reply to my emails. However I managed source some from the Rhythm Active eBay store. The repair itself was probably the fastest I've ever done, largely due to the fact these things are built so well, and have such a great service manual (see Analogue Renaissance). To open it up, you just have to unscrew 2 screws on either side of the keyboard, and voila. Next I disconnected the cable harnesses on the "module board", unscrewed it from the keyboard chassis, and de-soldered the offending VCA ICs. 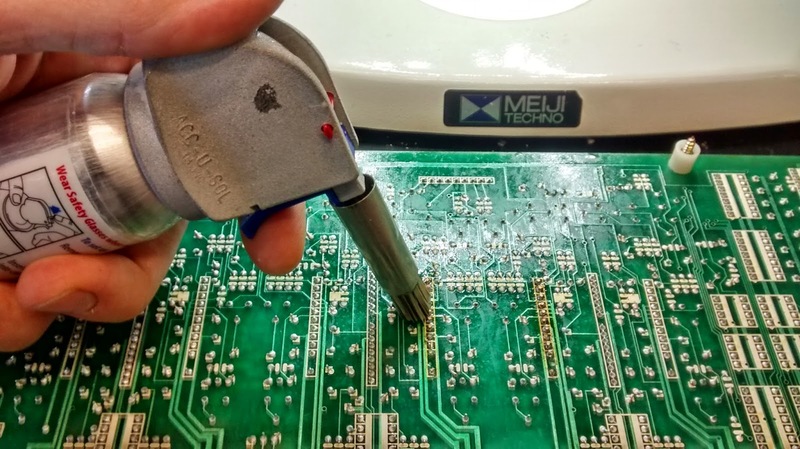 There's a few ways you can desolder a "thru-hole" IC like this one. 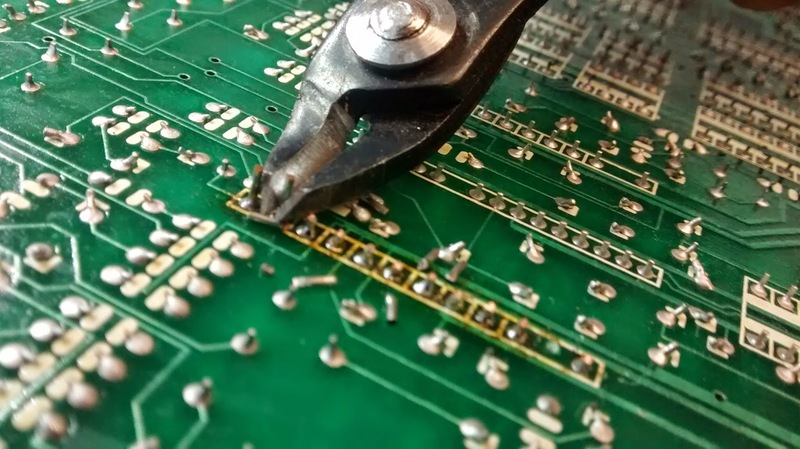 Normally I'd just snip off the body of the IC from the pins, and remove the pins from the board one-by-one, but in this case there were too many other components in the way for my side-cutters. 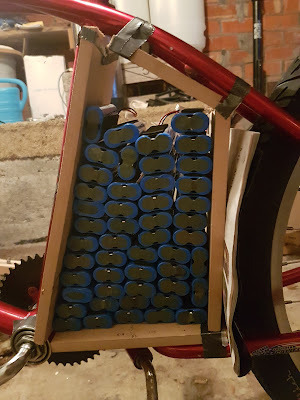 Another way is to heat the whole section of the board up with a heat gun, and then just pulling the whole IC out in one go. I was feeling lazy and just opted for the solder wick option. For this to work well you need a good, hot, solder iron, and fresh solder wick. 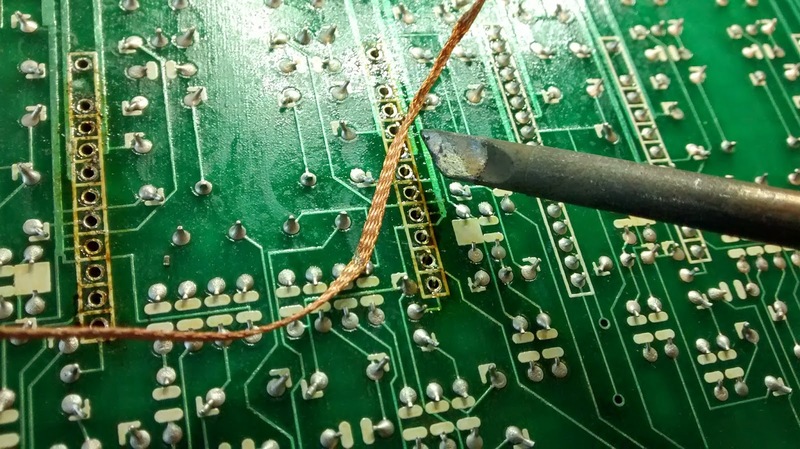 It literally just wicks the solder right out. Sometimes you can't get the last little bit out, so what you do is apply more solder back to the joint, then try the wick again. It's a cheap, effective way to rework. I've seen other people poo-pooing this technique on the internet, but don't listen to them. 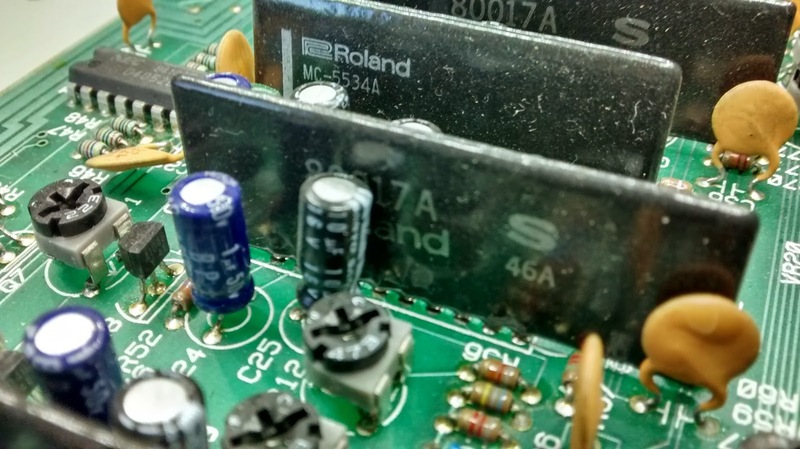 It works fine for these older board with really big holes, and small pins. Then I wacked the new ICs in, soldered them up, and trimmed the legs. Got rid of the flux residue with a special cleaning agent and bam! 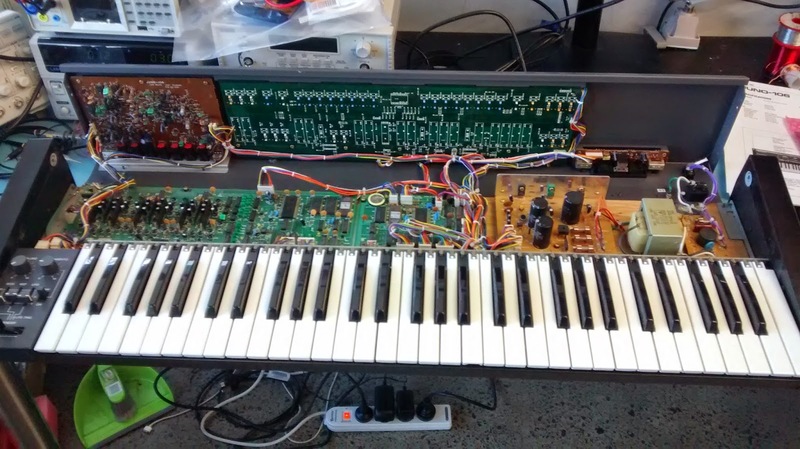 Then I powered up the keyboard, ran the test sequence, and confirmed the chips were all working properly. After this I performed the calibration procedure described in the Roland service manual. You're meant to do this when you install new chips, as it's an analogue system, and the parts can have a bit of variance in their performance. Basically the procedure "tunes" the keyboard voices, so they all sound similar, and stay in pitch. To do this you need an oscilloscope, a multi-meter, and a frequency counter. 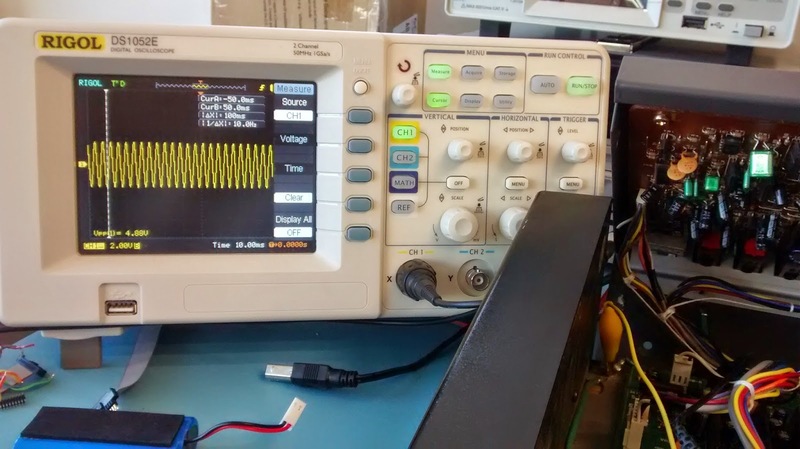 I cheated and just used the frequency counter on the oscilloscope, but I don't think it really matters. Most importantly, I now have a fully working Juno 106. It sounds like the future! If any of you out there have a stuffed Juno - go ahead and fix it. 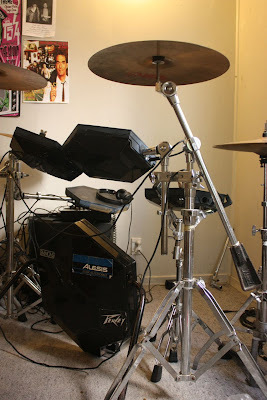 It's really easy, and they sound awesome! Bravo! What a beautiful and conscientiously designed machine. Was it very far out of calibration with the new chips? It wasn't crazy out of calibration, but defo needed a tweak - they basically sound a bit out of tune if some of the voices are out. 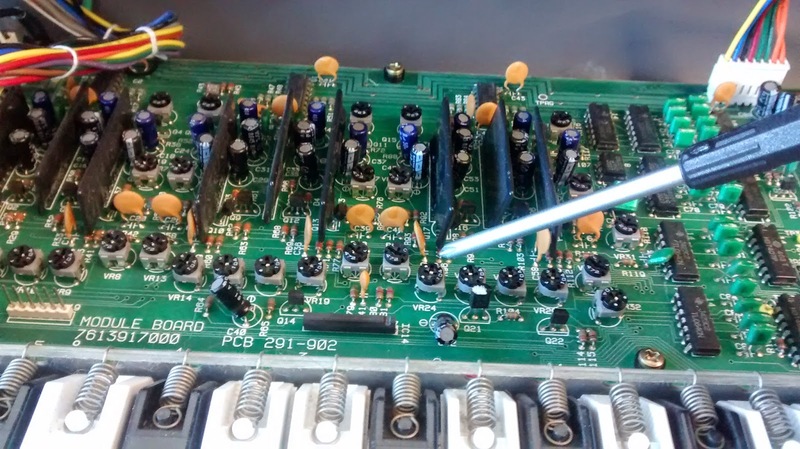 Amazing... We can repair a musical instrument. I have some best instrumental ringtones want to share to you.